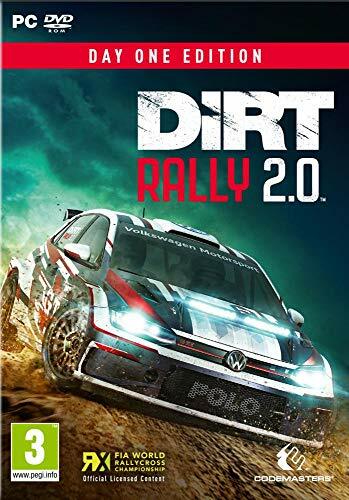 Codemasters presents the sequel to DiRT Rally, an release that comes just over 3 years after the previous iteration of the game dedicated to off-road motor racing. Mud and speed lovers will therefore be delighted to discover this new title which, according to the first images, benefits from a beautiful touch of modernity. We decided to take the wheel to appreciate this evolution and travel the world behind our PC. What is DiRT Rally 2.0 hiding under its hood? 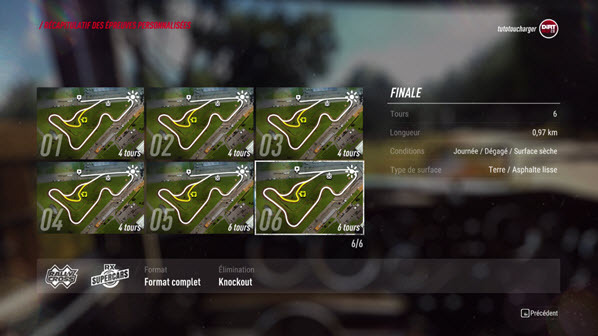 Codemasters offers in this new opus many cars including the Citroën C3 R5 by Stéphane Lefebvre and the Camaro GTR 4. As for the circuits, you can enjoy mud baths all over the world, in real places virtualized by the developers. 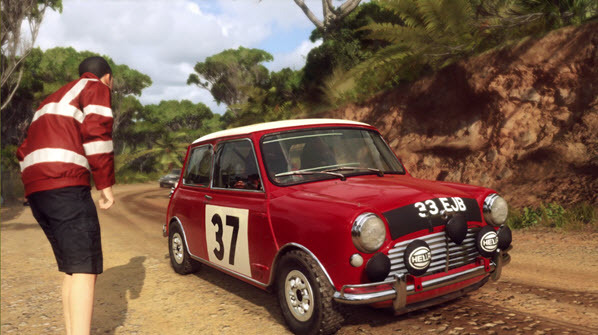 The game gives you the opportunity to travel through roads and forests in Australia, Spain, Argentina or Poland. Other destinations are available for Rallycross competitions. As you will have understood, DiRT Rally 2.0 offers to devote itself to both disciplines: no jealous, no left behind. However, fans will regret the absence of some rallies such as those in Germany or Sweden that are offered in the Season Pass. It's a shame to put your hand back in your pocket to enjoy it. 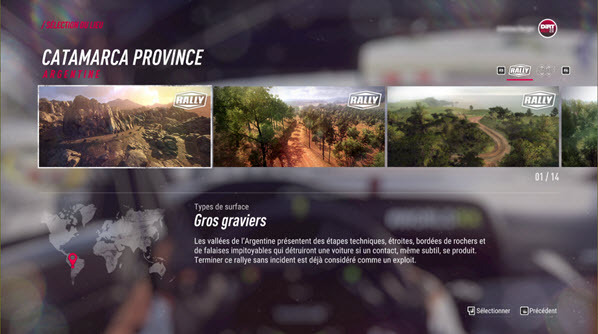 As mentioned above, everyone is served in DiRT Rally 2.0. In the "free game" section, players have access to mythical races that must be unlocked gradually. The FIA World Rallycross Championship is also on board with its 8 stages. During your journey, you will go to England (Silverstone), Canada (Trois-Rivières), or Brittany on the Lohéac circuit. The game also allows you to create your own championship. In this competition, it is possible to compete against the AI or other DiRT RALLY 2.0 players online. The classic time trial race is also part of the game. 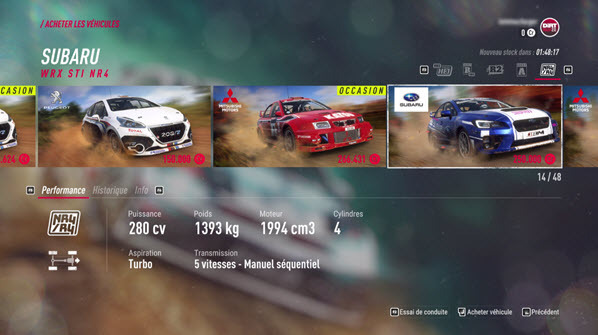 DiRT Rally 2.0 includes a "My Team" career mode that gives you the choice between rally and rallycross. A series of daily and weekly challenges are present. These challenges allow you to win Cr credits. With these virtual funds, the player can add vehicles to his garage. It should be noted that driving tests are available before each purchase to study the behaviour of vehicles on different surfaces. The player will, of course, be able to make some improvements on his cars as he progresses, again using his credits. Cr credits also allow you to develop your team by recruiting new engineers that you can develop by assigning them new skills, through training. Although complete, this career mode lacks some relief and seems quite "cold". A short story about the car or a young driver could have given more depth to this already well-crafted opus. That's all very well and good, but what is the real value of this new title DiRT Rally when you're in the cockpit of your car? In terms of realism, DiRT Rally 2.0 is doing very well. The behaviour of vehicles is quite well materialized according to the surfaces. The same is true for mass ratios, especially in curves, with sensations faithfully transcribed. The simulation is incredibly accurate and differs greatly from the DiRT series arcade titles thanks to its improved physics engine. One thing is certain, if you are a beginner, you will need to get in tune with each other to get good results. Without being very difficult to handle, the title still requires a lot of precision. The slightest mistake is paid for in cash. You can be on the roof in a split second because you haven't decelerated enough, or you can get off the road after a poor trajectory assessment. We're not going to lie to each other, it takes a while to get used to the physics engine. We therefore recommend that you do not disable your co-pilot's indications to progress faster. Besides, let's talk about your partner. His instructions come at the right time and are precise. The immersion would be perfect with a more realistic voice rendering. We're quibbling a little, but the co-pilot's voice is a little too smooth. Whatever, you may say, that's not the point either. 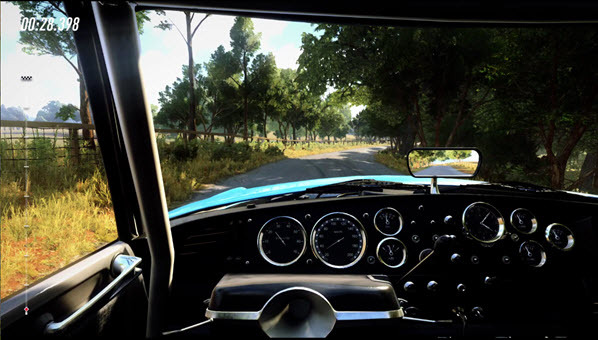 The game's graphics are meticulous and also participate in the race for realism that Codemasters studio has embarked on. Vehicles are well modelled, from the bodywork, to the tires, to the reflections on the windows. The same is true for the textures of the decors, which lack a little gouache but remain correct. Therefore, do not expect a visual slap. The interest and true value of this game lies elsewhere. The "Codemasters" give us a very good title that emphasizes, above all, realism. The sensations at the wheel are brilliantly well transcribed. The studio is very detail-oriented when it comes to vehicle behaviour. Unfortunately, the title lacks a little depth and remains perfectible, especially when it comes to graphics and career mode. Season Pass requires, the basic content will probably be considered not very rich by some players (absence of some official rallies). Whatever the case, fans of the genre will appreciate DiRT Rally 2.0, which is more than ever the reference in the field on consoles and PCs. Forza is also present on mobile phones under the name Forza Street, a free to play title also available on Windows. 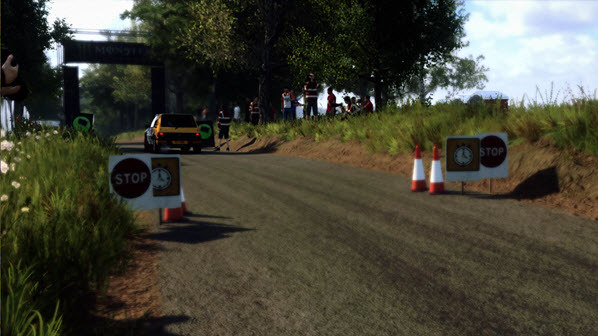 DiRT Rally 2.0 is a car racing game that is a great part of rally and rallycross competitions.